Lighting is everything! Whether it’s natural sunlight, subdued ambience, perfect practicals or complex Hollywood style lighting, the image owes all of its power to light. An expensive but required type of light in most higher-end video production projects is HMI lighting. For pure lumen power, HMI’s are hard to beat. They can be temperamental, flickery and a pain to move but when you need them there is no substitute. HMI’s come in many different types but the main differences come down to a few simple things. Ballasts. Newer, more expensive ballasts are electronic. Older, cheaper ballasts are magnetic. Electronic ballasts are lighter, more energy efficient and can be flicker-free which makes a big difference when using different frame rates. Magnetic ballasts are bigger, heavier, use more power and can lead to big issues when not shooting at 1/48 or 1/60 shutter speeds. The choice is simple if you have the money but magnetic ballasts can work just fine in certain situations. Lens/Globe – The basic two types are Fresnel and Par. Focusable Fresnel heads which provide less punch but an-all-in one unit that are adjustable to a finer degree are good in certain situations where a little less light is needed and you don’t want to carry around lenses. Par heads are better for a wider degree of adjustment by swapping out lenses from an external case and an often times more powerful overall output. If I had to choose one head I would most definitely take a Par. A unique aspect of HMI’s that make them significantly better than tungsten sources in many situations is that they are naturally balanced to sunlight. This means that the light they emit is between 5000 and 6000 degrees Kelvin and will match direct sunlight. Adding full or 3/4 CTOrange gels to an HMI to match tungsten lighting at 3200 Kelvin will only take away 2/3 of a stop but adding full CTBlue gels to tungsten lighting will take away 2 stops from a source that is already far less powerful per watt. If you are adding supplemental daylight colored lighting then HMI’s are definitely the way to go. In the last 10-15 years technology has given us a couple more options to compete with HMI’s but at this point they are still limited with their uses. 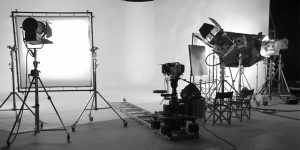 LED’s and Fluorescent lights such as KINO FLO’s are amazing lighting tools but they do not have the same sort of ‘punch’ that HMI’s do. Fluorescents are inherently softer but have less throw than HMI’s while LED’s of the spot variety can muster a decent amount of throw it will still take an expensive array of LED’s to compete with even a 20 year old, used HMI. If you’ve never used an HMI I urge you to go to a store that sells them, rent one from a rental house or check out one from a friend. They are amazing lights and despite their complexities they offer something no other instrument can.